What I bought with my birthday money Part 2 - Topshop, H&M, Forever 21. Why must clothes be so difficult to get pictures of? First off I popped into topshop, I picked up 3 more pairs of frilly socks on the 3 for £8.00. Next I picked up two of these ribbed crop tops, they were £8.00 each. First from Forever 21 I picked up this cropped vest with lace round the bottom, this was £12.00. I also picked up these high waisted shorts they were £11.50. Last but not least I picked up this bag, it was only £19.99 and it's so roomy. So I hope you enjoyed this post, if you'd like to see a what's in my bag leave me a comment. Today I've got the final Best of beauty blog challenge post for you. Apologies for not posting last weeks but I really had nothing to say on the topic so I decided it would be better to just skip a week than force a rubbish post. That being said I'm so excited for this weeks topic, I hope you enjoy this post. So there is so many fantastic blogs out there but these are some of my favourites, I was wondering if you guys would enjoy a monthly post like this so you could see what I've been loving reading. Onto today's post as I mentioned these are in no way all of my favourite blogs! The first blog is Autumn leaves . 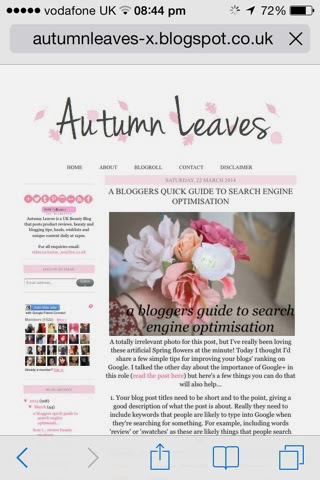 Autumn leaves is written by the lovely Rebecca it's the perfect mix of beauty and blog advice. She also has some amazing post ideas. Her photos are stunning and set out so there not to busy or to bare. 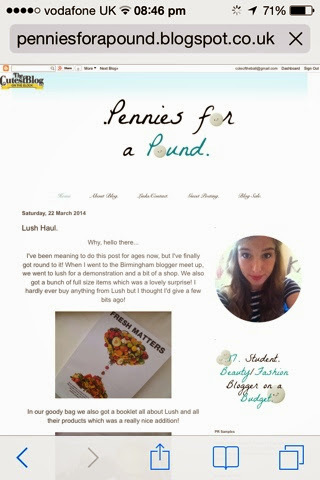 The next blog is Pennies for a pound. I love Naomi's blog as it almost feels like she is just stood in front of you chatting away. Her blog has a very casual feel to it. Next is Tattooed Tealady . If I'm thinking about buying pretty much anything I like to check if Sophia has reviewed it. 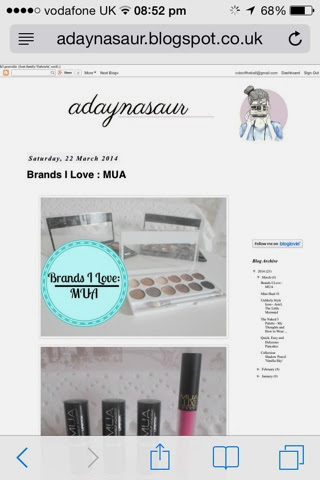 I love how detailed her reviews are and I just generally love reading her blog. Can I first just comment on Dayna's blog name, is it not just the cutest thing ever. I love the mix of posts on her blog, I also really like how her reviews are nice and short yet still packed with information. 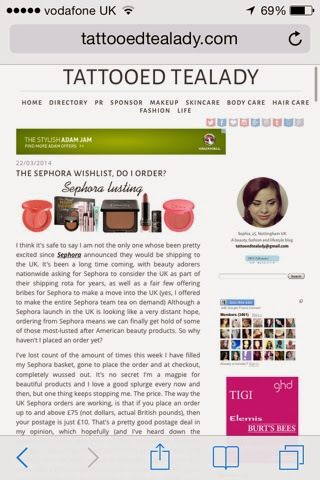 Dayna's blogs just a good all rounder really. 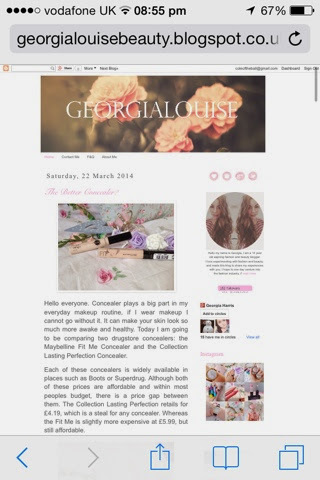 The final blog for today is Georgia Louise beauty . Georgia's blog is such a lovely mix of beauty and fashion, her OOTD pictures are stunning and her blog always feels really welcoming. Her posts are super detailed and read as though she puts so much hard work into them. So guys I hope you check some of these blogs out, I'd love you to let me know what our favourite blogs are! From left to right... Lacquer balm in vivacious. Matte balms in Unapologetic, Showy and Elusive. Swatches from left to right. Vivacious, elusive, showy and unapologetic. I'm going to start with the lacquer balm as I only have one. This is such a beautiful colour, these are so lovely and moisturizing and they leave a glossy finish on the lips. These don't last as long as the matte balms (About 4-5 hours to be precise) I find they apply smoothly to my lips all the time, even if they are quite chapped. Moving onto the matte balms, these are my favourite of the two as the colours are a bit brighter and they last longer. I'm so impressed with these as they are matte yet still moisturizing. This one is the most perfect mix of a blue toned pink and a purple. It reminds me a little of a more toned down version of Mac up the amp. If I had to pick a favourite I think this would be it. It's somewhere in between a coral and a pink and I just love how bright it is. This is the shade I bought because of the hype, everyone seemed to be talking about this shade and I had to pick it up. I've really been loving this one for everyday. I find the matte balms to last somewhere in the region of 6-7 hours depending on what I do and how much I talk! Overall I love these so much, if you haven't tried them yet then you should! When I asked you guys if you'd like to see this I had quite a few responses saying yes, so if you don't like posts like this don't feel like you have to read it! I'm not trying to brag I just want to share my storage with you! I actually had to move my drawers to the window so I could get some decent photos but this is were they are in my room. The pot on the left is from Ikea and it holds my eye brushes and the one on the right is an old plant pot which I added a little sparkle to, it holds my face brushes and a cute little sparkly butterfly I bought from a Christmas shop. The nail polish in front of my face brush pot is Barry M Blueberry. On top of my draws I keep some of my favourite skincare bits, and a Yankee candle in black cherry. I have my Lush sweetie pie shower jelly (It may seem odd that I keep this in my room, but their is someone on my bathroom who like to use all my nice smelling bits and bobs so here it's out of their way!) I've then got my palmers cocoa butter concentrated cream, my botanics super balm, my lush bubblegum lip scrub and my Avene Cleanance K. I've also got a pot with some of my stick/tube eye products. In the pot I have some mascara's, cream eye shadow sticks, my brow pencil and my eyeliner pencils. My favourite mascara is They're real from Benefit. In the first draw I have my base products, some of my favourites out of here are benefit porefesional, my sleek contour kit and my maybelline fit me concealer. I'e also been loving the L'oreal true match foundation but I haven't had it long enough to form a proper opinion on yet. Next drawer down is blushes My favourite's from this draw are my sleek blushes, topshop cream blush in flush and benefit sugarbomb blush. My third drawer is filled with smaller eye palettes and single shadows. I have some Mua shadows, a along came betty quad, a body shop quad, a essence quad, a trio from bourjois and some 2 true duos. I also keep my bases in here so I have my Mac paint pot, my urban decay primer potion and my maybelline colour tattoos. The next draw has my bigger eye palettes and eyeliners. Moving on to my favourite 2 draws I have my lip products. In the first of my two lip draws I have all my lip products that aren't actual lipsticks so I have things like the Collection cream puffs, the Revlon matte and laquer balms, the Bourjois colour boosts, OCC lip tars and other bits and bobs. Finally in the bottom draw I keep my lipsticks, my two favourites at the moment are Mac up the amp and Barry M 151. So guys that's it I really hope you enjoyed this post, do you like this kind of post. If you'd like to see individual collections like my lipstick collection or my blush collection.